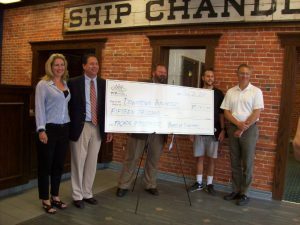 Thank you, Erie Downtown Partnership! Early Connections was one of the downtown businesses that proudly received a $2,595 Façade Improvement Grant from the Erie Downtown Partnership. The Façade Improvement Grant money currently awarded to businesses downtown totaled $15,000. This grant will help provide the funds needed to replace the windows at our City Center location. City Center’s window installation is scheduled for October. 1. Improve the appearance of the State Street side, eliminating current peeling paint and weather-damaged wood frames. 2. Improve energy efficiency by installation of windows designed for this purpose that have efficient insulating properties. 3. Improve children’s safety using windows that are the most up-to-date and resistant to damage. Over the next few years, as funding sources become available, it is our intention to replace the remainder of the windows on all sides. Above picture, from left to right: Chris Mong, Director of Economic and Community Development for the City of Erie; Michelle Harkins, Associate Executive Director, Early Connections; John Buchna, CEO of the Erie Downtown Partnership, Alex Kanonczyk, property owner at 418-420 State Street; and Jeff Kidder, Architect and Partner, Kidder Wachter Design.